Let's warm up with some quick FAQ for starters. Polyodon spathula is a freshwater fish that can be found in the Mississippi drainage, from the Missouri River in Montana and southward that is at risk of extinction. Are there any common names that are used when talking about this particular species? Yes, Polyodon spathula is also known as the American Paddlefish and synonymous with spoonbill, spoonbill cat, spoonbill catfish, Mississippi Paddlefish, spadefish, shovel-billed cat, duck-billed cat, shovelfish, and just plain Paddlefish. ***For simplicity's sake and to decrease the chances of confusion with all these names for this organism, this web page will only utilize the three terms Polyodon spathula, American Paddlefish, and Paddlefish interchangeably when speaking about this organism. 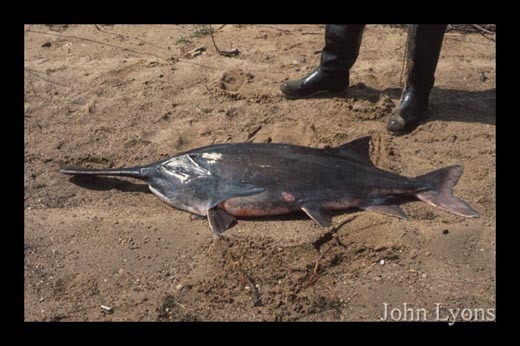 How does an American Paddlefish look like? A typical American Paddlefish has a large, gray scale-less body, a snout that protrudes into a large paddle-shaped structure, a shark-like forked tail, and gills that extend into long, pointed flaps. Very much like Figure 1 below. Why should you care about Polyodon spathula? Polyodon spathula is found only in the United States now since it has been declared extirpated in Canada. However, Polyodon spathula is very quickly becoming extinct in the United States also like the only other member of the Polyodontidae Family, the Chinese Paddlefish. How is Polyodon spathula classified? To find out the answer, let's start our exploration with the Classification of Polyodon spathula! Visit MultipleOrganisms.net to explore more organisms! Visit the University of Wisconsin La Crosse, birthplace of the Multiple Organisms web pages!